For our second feature here at SteamWomen, we are pleased to present to you Teri Lenfest (known in some circles as "Kat's Mom.") She currently resides in the San Francisco Bay Area of California. As a 69-year-young steampunk woman. I kind of see myself as a modern steampunk Grandma Moses. 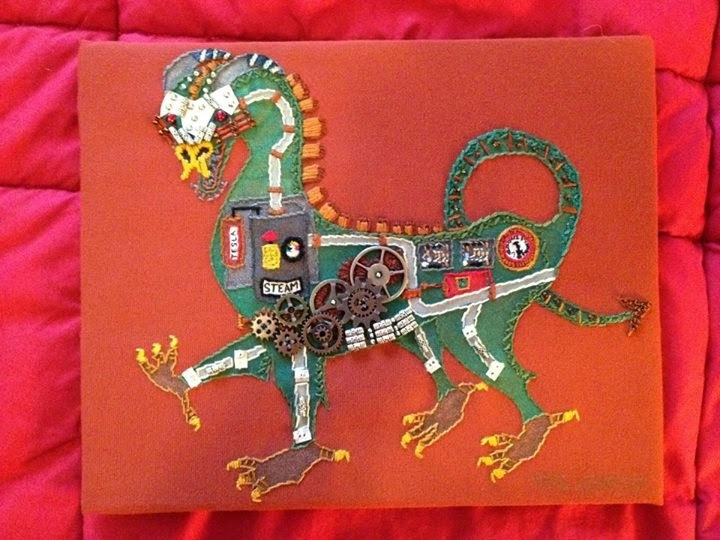 I didn’t get into art until well after I retired and got into steampunk. I’m self-taught and am learning as I go along. When I started painting, no one was more surprised than I was by the results. 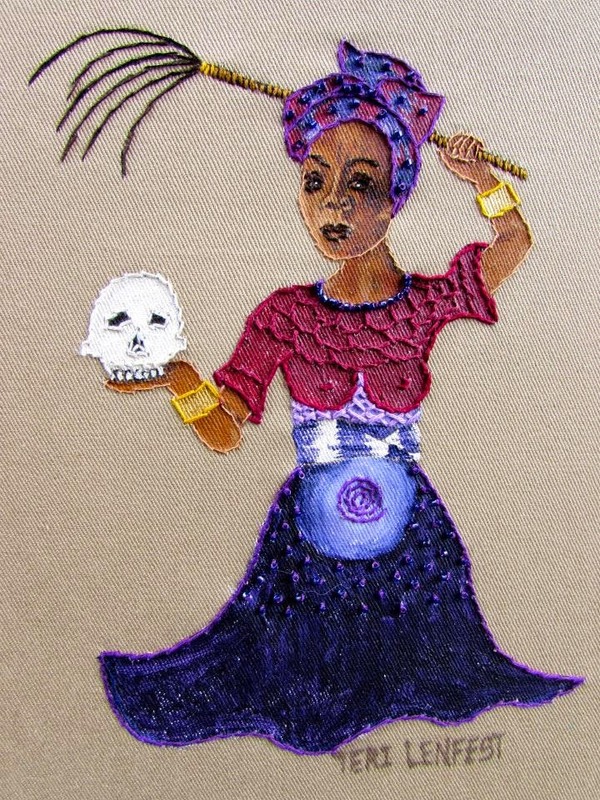 Multimedia fabric art has become my thing and, within the last year, multimedia fabric art Goddesses have captured my attention. I will do a panel on Goddesses at Clockwork Alchemy this year and think it should be a very interesting discussion. My daughter introduced me to the band Abney Park at least 10 years ago. I immediately fell in love with them and the story they were telling. Later, she took me to my first Steamcon and I was hooked. Way back then, you couldn’t Google steampunk and come up with a selection of clothing, music, gadgets, jewelry, or anything else. If you wanted to be steampunk, you had to learn how to make things yourself. This was exciting. It was invigorating. People were feeding off of each other’s creativity. There was a lot of sharing: knowledge, skills, websites, contacts. It was like an creative feeding frenzy. I was sucked in and I loved it. I started sewing and designing; then, because I couldn’t find what I wanted anywhere else, I started painting and embellishing. And, it isn't limiting. 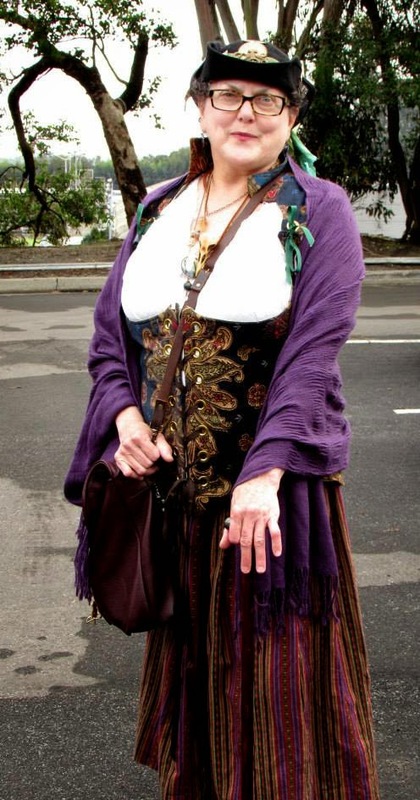 Steampunk attracts people from 8 to 88, able-bodied and handicapped, and all ethnicities. It encourages creativity, design, imagination, and game playing. It’s a wonderful, beautiful, crazy place to be. How would you define steampunk? Steampunk is difficult to define. When you see it, you know it, but how do you define it? I always say that if you go back to the Victorian age of corsets, bustles, top hats, and facile hair, dump in a little Poe and Lovecraft, stir in some Firefly, Doctor Who, Torchwood, and Mad Max, and shake it well, you’ll probably end up with something like steampunk. It’s a mixture of late 19th century esthetics and post-apocalyptic punk. Think robotic limbs and bustles; top hats, waistcoats, goggles, and gas masks. It depends upon whether I’m doing a commission or not. If it’s a commission, I work very closely with the purchaser in order to try to envision what they want. That’s a very difficult process, as I know that they have something specific in mind and my job is to figure out what that is and reproduce it. It’s hard to explain what I do when I’m creating on my own. I don’t sketch out a plan or have a diagram. I call it meditation. I’m almost in a zen state. I’m not really thinking about what I’m doing as I’m doing it. I’m totally zoned-out, in the groove, going with the flow. I start with a basic pencil sketch on paper, then use fabric marking transfer paper to trace that image onto a piece of fabric, which I then paint with acrylic paint. 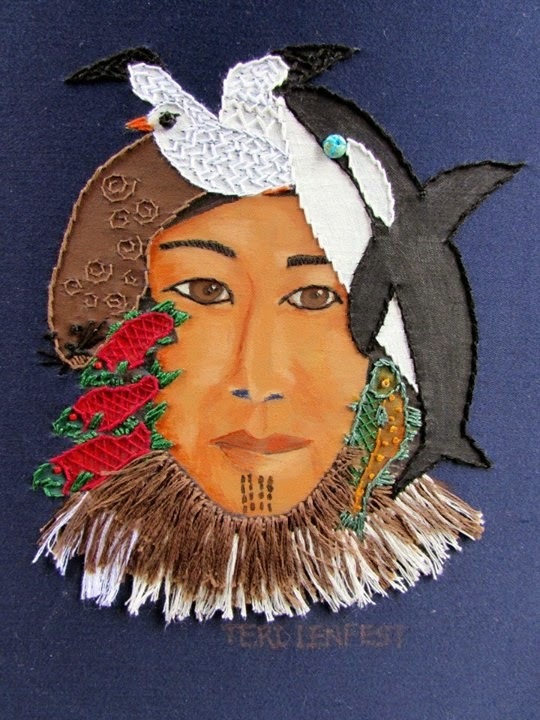 After that, I add embroidery floss, pleather, feathers, beads, found objects, ribbons, and sundry other items to embellish the design. And, when it’s done - it’s done. It’s like some kind of crazy magic going on. I seem to be doing something that’s uniquely me, so I can’t say that I’m inspired by the art of anyone else. Right now I’m working on Goddesses. I didn’t know much about them when I started. My first was Gaia and I was pleased with her. Then, perhaps because I’d changed my mental filter to search for Goddesses, I discovered that a lot of other artists I knew were also doing Goddesses, most of whom were Greco/Roman Goddesses. I didn’t want to do what everyone else was doing, so I decided to see what other Goddesses I could find. I was astonished by the enormous number of Goddesses that I’d never heard of before. Every culture, ethnicity, and religion had Goddesses, from Inuits to Incas to Yorubas, to Japanese, to Native Americans, to Russians. Goddesses were everywhere. I live in a very impoverished neighborhood, where youth have very little hope or self esteem. My goal became to create Goddesses that youth could identify with. I wanted a young woman to be able to look at my Goddesses and find one that had skin and hair and eyes just like hers. It became an obsession with me. I would research a Goddess to find out as much as I could about her, then I would Google faces from that ethnicity or tribe until I found the face and clothing that I wanted to recreate, and I used that information to create Goddesses that people could relate to. What advice do I have for young steampunks? In the beginning, we had nothing. If we wanted it, we had to figure out how to create it. In recent history, some members of the steampunk community have determined that what they think qualifies as steampunk is steampunk and what they think isn’t, isn't. This trend reminds me very much of high school cliques. If you conform to my vision, you’re in. If you don’t, you’re out. In my opinion, this stifles creativity, and creativity is what steampunk is all about. So, my advice is not to listen to the clique segment of steampunk. Ignore them entirely. Create away. Do what makes you happy. Share what you learn and learn from others who are willing to share with you. Experiment. Research. Innovate. Throw this and that together with abandon. Have fun! Steampunk is about creativity and having fun with others who are creating and having fun. She can be contacted at: wetlandwriter@gmail.com or on FaceBook - you can see a gallery of her Goddess images here. It can also be seen in the Art Gallery at Clockwork Alchemy, in San Jose, Calif., Memorial Day weekend. "then I would Google faces from that ethnicity or tribe until I found the face and clothing that I wanted to recreate"
I think that's really wonderful! It's important to realize that ethnicity is more than just skin color, and to really research the cultures you want to express in your artwork.